Most well-known for his account of the martyrdom of St Thomas Becket, Gervase of Canterbury was a 12th-century monk at St Augustine's and a first-hand witness to the archbishop's disputes with Henry II and his martyrdom, as well as being involved in the aftermath of appeals to the pope and Richard I. His recorded the history of Canterbury in the 12th to early 13th century in a 'Chronicle' covering the years 1100 to 1199, an 'Acts of the Kings' ('Gesta Regum'), which abridged the 'Chronicle' and continued into the next decade, 'Acts of the Archbishops of Canterbury' to 1205 and a 'Map of the World', a topographical work listing the bishoprics of England, Wales and part of Scotland. 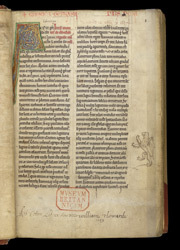 This 13th-century manuscript containing part of Gervase's 'Chronicle' and other works on Canterbury belonged to the priory of Christ Church cathedral. The first page of the manuscript begins with an account of the burning of the cathedral's choir in 1174 and its rebuilding (begun by William of Sens and finished in 1184 by William the Englishman). In the lower margin, two post-Reformation book collectors, William Howard and Robert Cotton, have inscribed their names, proclaiming their ownership of the book. The drawing of the lion in the margin may have been the work of the heraldry-obsessed Robert Cotton. The name 'Edmerus' in the top margin was written in the 16th century by Cotton's librarian, mistakenly identifying the text as that of Eadmer (c.1064-1124), precentor of Canterbury.